The road to recovery is often a slow one paved with unglamorous work and a whole lot of grinding. In other words, it's a road perfectly suited for Marc Gasol and the Memphis Grizzlies. After missing 23 games and seven weeks with an MCL sprain, Gasol surprisingly returned to action Tuesday night against the Oklahoma City Thunder despite going through just one full practice during his rehabilitation process. The sense of urgency requires little explanation. Without the services of the reigning defensive player of the year, the Grizzlies had gone 10-13 while stumbling out of the playoff picture. A win at home, where Memphis has already lost more games this season (12) than it did all of last season (nine), could start both Gasol and the Grizzlies back on the right foot. This was, for all intents and purposes, the first step in the road to recovery. Of course, as we all know, that first step is often the hardest, and it certainly looked that way early on. Gasol isn't exactly a floor burner even when he's completely healthy, but it was evident that he was struggling at first to find his legs, as he largely floated in the background on both ends. The slow beginning, while certainly reasonable and to be expected, stood out if only because Gasol typically initiates so much of what Memphis does offensively. Instead, on this night, the Grizzlies offense defaulted to a player Gasol had never even shared the floor with before in Courtney Lee, who was filling in for the injured Tony Allen. For as much as Gasol will remove the pressure off an excellent spot-up shooter like Lee down the road, the roles were temporarily reversed in the first quarter. While Gasol finished the first period scoreless and a little breathless, Lee piled up 12 points to help the Grizzlies keep pace with a Thunder team that's all too familiar with playing this matchup at less than full strength. And in a lot of ways, this was déjà vu all over again for both the Thunder and the Grizzlies. Without Russell Westbrook in the lineup, just like in last season's playoffs, Kevin Durant took charge and probed his way to a 37-point performance that would have been good enough most nights. But aside from some solid defense from another new face in James Johnson, the only thing standing in Durant's way in the clutch was, quite literally, Gasol. Late in the fourth quarter with Durant barreling down the right side of the lane with the ball, Gasol put his body -- recovering knee and all -- right in the direct path of Durant. You could tell he wasn't particularly thrilled about doing this -- he turned his body at the last second like most anyone would when facing a collision -- but he did it anyway. Charge. Grizzlies ball. Maybe Gasol's body wasn't quite willing yet, but the mind, which has always been his biggest strength, compensated just fine. It was the type of play we've seen Gasol make many times before, but this one carried extra weight. Over the course of the past 23 games, the Grizzlies had looked disjointed without Gasol. Backup bigs Kosta Koufos and Ed Davis, while each talented in his own ways, just didn't always know where to be. For Memphis to succeed, every ounce of space and every millisecond of time has to be maximized. They're just not talented enough otherwise, and, in Gasol, the Grizzlies got their heart and their pacemaker back. That much was evident a few offensive possessions after the drawn charge. With the shot clock winding down on an ugly possession not uncommon to the FedEx Forum faithful, Zach Randolph (23 points and 13 rebounds) shoveled the ball to Gasol in what could be best described as a "flaming bag" of a pass. But Gasol, perhaps used to this sort of thing by now, knew exactly what to do with it. After a tiny, efficient ball fake to earn himself some extra space, he leaned back in the La-Z-Boy and fired up a jumper that splashed through the net. With a relatively safe six-point lead in tow (Serge Ibaka would end up missing a chance to tie with a 3), Gasol did something funny as he came back up the court. With all the adrenaline pumping from the big shot, Gasol galloped a few times down the sideline. Then, as he was galloping, he slapped his own backside. It was a little silly, sure, but also pretty fitting. The road to recovery -- from injuries, from a coaching change, from a losing season -- will be long and arduous, but with Gasol back, the Grizzlies know exactly who to ride. D.J. Foster writes about the NBA at ClipperBlog, part of the TrueHoop Network. MVP: Anderson Varejao and Luol Deng were a dynamite defensive duo despite the Lakers' crazy shooting. On a night when Kyrie Irving struggled, Varejao posted an 18-point, 18-rebound double-double and added six assists. Deng nailed five triples on his way to a game-high 27 points. X factor: The interior. Cleveland negated LA's 12-point advantage in transition by pounding the rock inside. The Cavs collected 16 offensive rebounds on their way to 19 second-chance points. In total, they finished with 46 points in the paint to the Lakers' 34 -- a 12-point difference. a game of runs: Eight lead changes and seven ties does not even begin to describe this roller-coaster; the two-point difference comes close. Cleveland's accuracy from beyond the arc (76.5 percent, 13 makes) kept them within striking distance. MVP: No one could say that DeMarcus Cousins wasn't impressive, especially in his 19-point, 10-rebound third quarter. However, Paul George scored 24 of his 31 after the break, including 13 during the 20-4 run that put the game out of reach. until George's running 3 at the third-quarter buzzer ignited a 20-4 Pacers run that ended things. easy for the Pacers. Sacramento showed some life early, and they hung around in the third, but these are teams on two completely different levels. The Kings have a lot of offensive talent but still need to learn to defend for the full possession. MVP: Al Jefferson. The Knicks had no answer for Jefferson, who brutalized them in the paint all night long via a series of deft, smooth low-post moves on the way to a season-high 35 points (14-for-20 shooting). X factor: Michael Kidd-Gilchrist. Playing in his first game since Dec. 3, Kidd-Gilchrist defended Carmelo Anthony one-on-one about as well as humanly possible, harassing him on the ball and forcing many a contested, bricked midrange jumper. Defining moment: With New York on top 43-38, the Bobcats went on a 17-3 run to end the second quarter, snatching the lead for good from a sluggish Knicks team playing the second game of a back-to-back. MVP: In his second start since being traded to the Grizzlies, Courtney Lee finished with a team-high 24 points, 14 of which came in the first quarter. 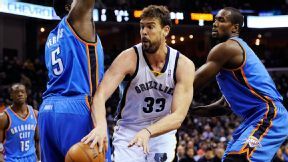 X factor: Last season's defensive player of the year, Marc Gasol, returned after missing 23 games with a sprained MCL. In 24 minutes, Gasol scored 12 points and grabbed four rebounds. the Grizzlies at full strength: With Gasol back anchoring the defense and Lee's shooting added to the starting lineup, Memphis might be ready to regain -- or even build upon -- last season's impressive form. Al Jefferson, Bobcats: Jefferson scored a season-high 35 points as the Bobcats snapped the Knicks' five-game win streak with a 108-98 win. Jefferson finished 14-of-20 from the field and had eight rebounds as the Cats retook the No. 8 spot in the East. OKC's 3-and-D guy missed all four of his shots en route to a scoreless night in the 90-87 loss to the Grizzlies. His 3-point shooting percentage has sunk to 29.6 percent this season, down from last season's 41.9. "I think we should take a picture, but we should make it quick before one of these guys starts yelling at Mario." -- President Barack Obama, poking fun at the visiting Heat's proclivity for chastising point guard Mario Chalmers. Marc Lebryk/USA TODAY Sports Roy Hibbert blocked Kings center DeMarcus Cousins here, but Cousins still managed 31 points and 11 rebounds. 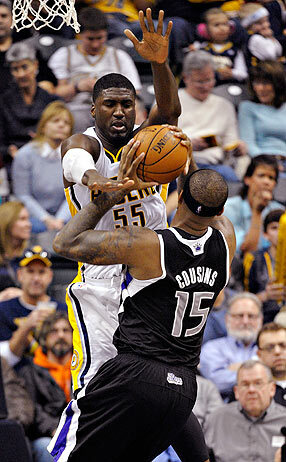 The Pacers rolled to a 116-92 win over the visiting Kings. Luol Deng's 27 points were highlighted by a 5-for-5 performance from downtown, and the Cavaliers needed every one of those 3-pointers in their 120-118 triumph over the Lakers. Deng became the first NBA player in the last three seasons to shoot a perfect 5-for-5 or better from beyond the arc in a game his team won by fewer than three points.